Eat your burger before it eats you!!! 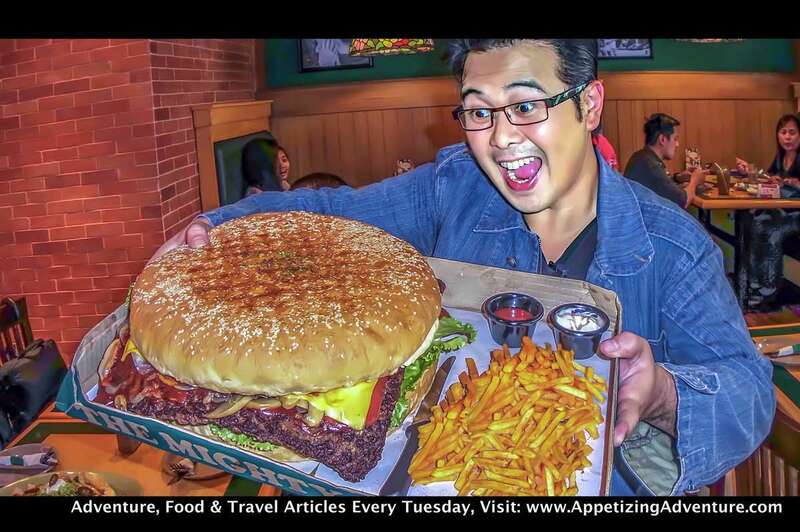 This monstrous burger is the star of the show. With its size, people need to have their pictures taken beside it. Something you must order at Casa Verde. The first time I experienced Casa Verde was in Cebu and I’m so happy they now have a branch in UP Town Center, Quezon City. My friends and I were so excited when the Big Bang was served. It’s a gigantic nine-inch burger. All six of us couldn’t finish it, and it’s not even the biggest burger they have. Maybe I should call for a family reunion and order their Mighty Ton (Php888). This burger might occupy most of the table space. 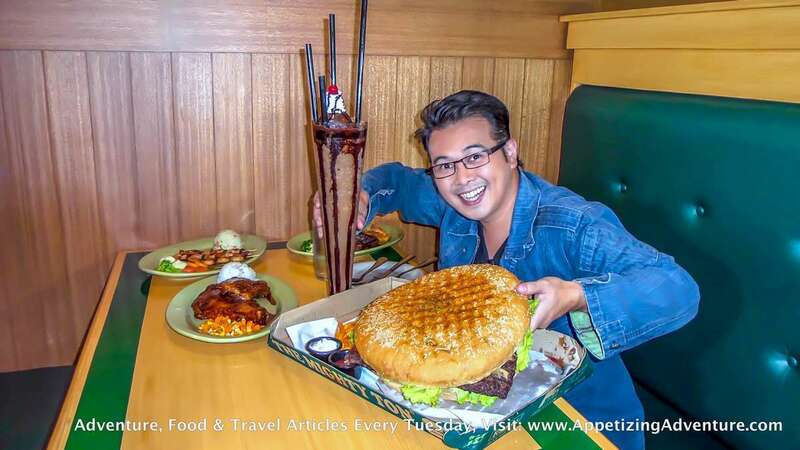 That’s a kilo of USDA tenderloin burger patty stuffed in their 12-inch homemade bun with bacon, American cheese, lettuce, tomatoes, onions, mushrooms and fries. What better way to enjoy this huge treat, than by partnering it with an enormous drink. 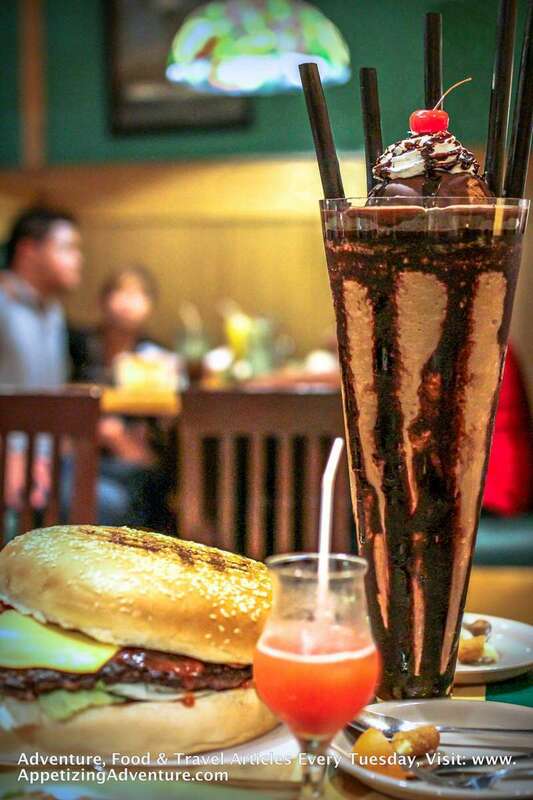 The Milky Way Shake (Php345) is the biggest chocolate milk shake I’ve seen and we all shared this sweet goodness. It’s served with several large straws. For salads, you can try Caryl’s Country Salad (Php193). 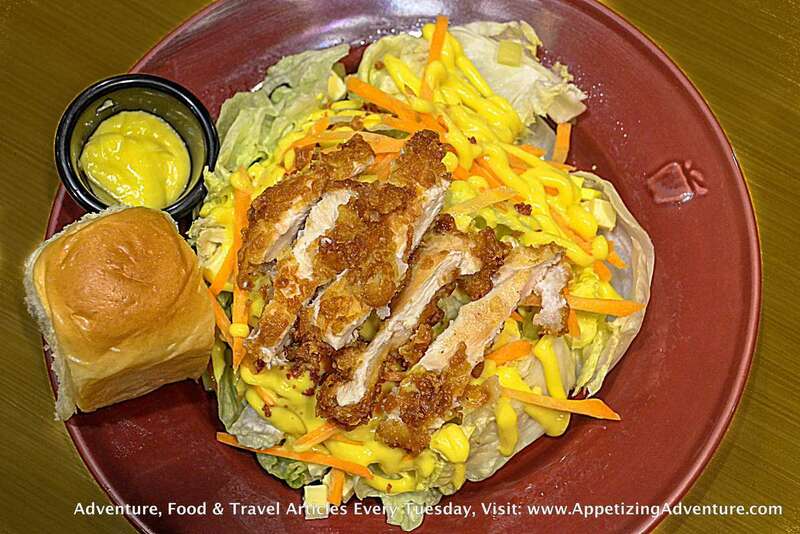 It has crunchy breaded chicken strips, greens, eggs, cheese, tomatoes, bacon and honey mustard dressing. Their appetizers are amazing. You have to order their Best Sampler (Php328). 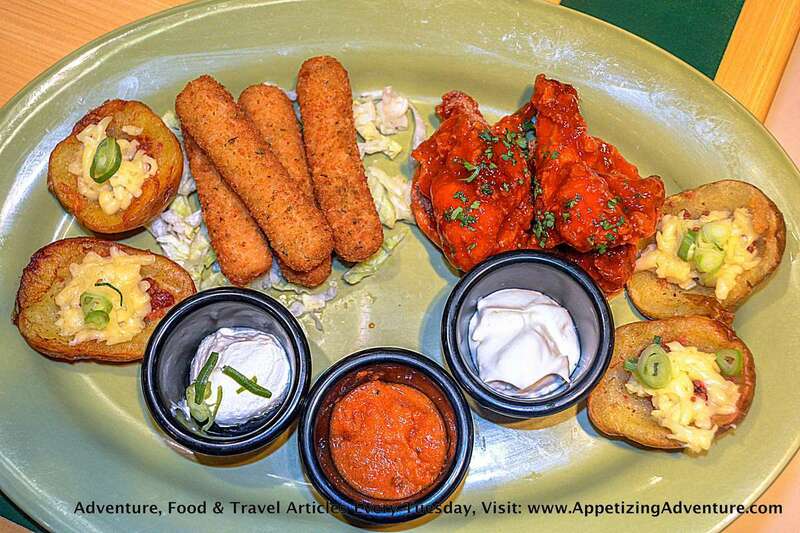 This includes their spicy buffalo wings, bacon and cheese potato skins and fried cheese served with bleu cheese dressing, sour cream and marinara sauce. For the main course, they recommend their popular Brian’s Ribs (Php250). That’s baked pork ribs with rice, corn and carrots. It’s supposedly good for one person, but the generous serving can be shared by two. 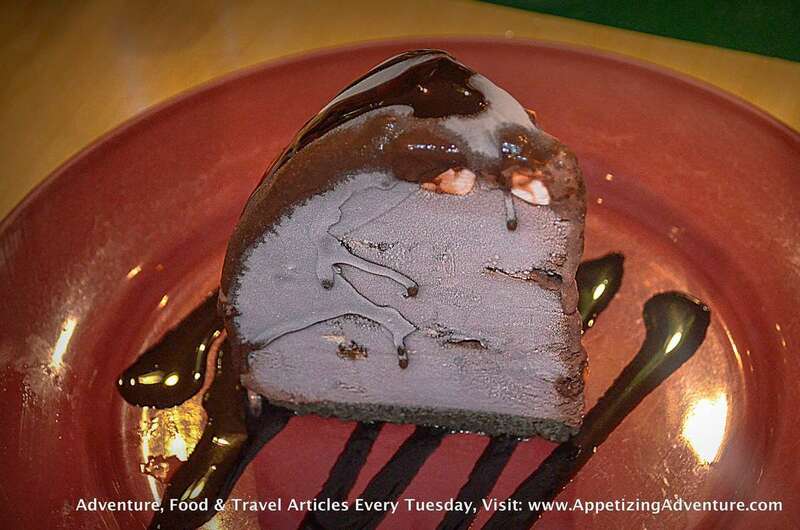 For desserts, they recommend Death by Chocolate (Php188). That’s chocolate and rocky road ice cream cake with chocolate bar bits on a chocolate cookie crust. My favorite though, is their Bliss O’ Berry (Php248). It tasted like a yummy orange ice cream cake. 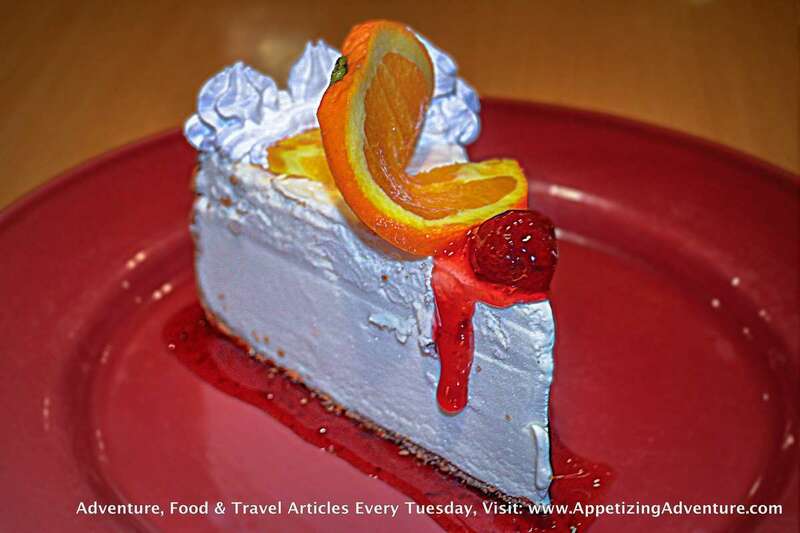 It’s homemade ice cream-based cheesecake paired with strawberry compote. Casa Verde means green house in Spanish. Their house in Cebu is green which explains it all. Their menu’s named after their family members. The restaurant’s well lit, with shades of brown and green on the walls and tables. These are relaxing colors for me. 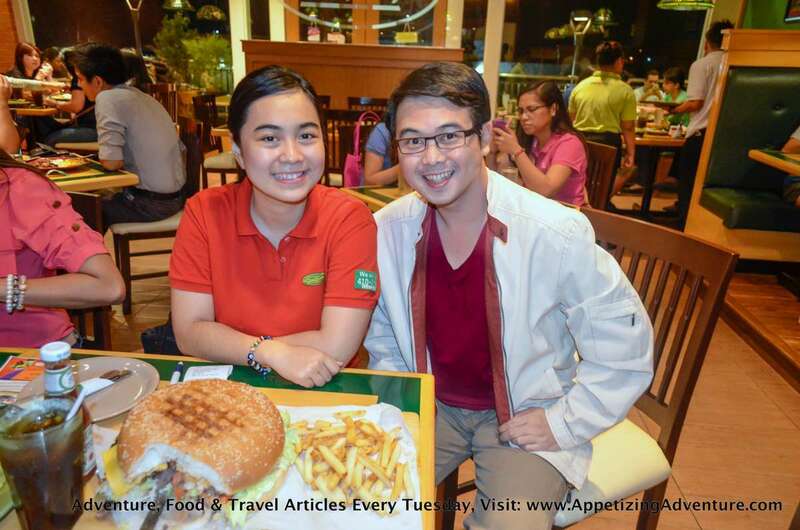 Established in August 2002, CASA VERDE is a chain of family-owned restaurants in Cebu City. Spanish for “green house”, CASA VERDE’s name was influenced by the owners’ Spanish roots and the color of the Ramos Branch, which used to be one of the family’s ancestral homes. Originally, the Ramos Branch was supposed to be just a small canteen that catered to the residents of the 2nd floor dormitory and some students from nearby colleges. Through word-of-mouth and recommendations by family and friends, the humble canteen soon became a full-scale restaurant. After almost a decade and three branches later, CASA VERDE has grown into one of Cebu’s most popular dining destinations. “Value for Money” has always been the restaurant’s philosophy. CASA VERDE believes that everyone deserves to enjoy great food and quality service at reasonable prices in a comfortable atmosphere. It’s casual dining at its best. CASA VERDE is the perfect place to let your hair down and enjoy a steak or two with family and friends. The ambiance is simple and casual, with knickknacks and collectibles from the personal collections of the owners. It’s also interesting to note that all of the restaurant’s signature dishes are named after some members of the family. We bring homestyle comfort food to the next level. The next time you’re in the mood for some good food, head on down to the CASA VERDE branch nearest you and try our best-selling ribs, mouth-watering steaks, sumptuous pasta, and sinful desserts. It’s a dining experience that truly exceeds expectations. *The experience here was based on my 2014 visit to Casa Verde. Prices and menu are subject to change without prior notice.